If you like this free game, try Spoiler Alert. This 2D platformer is just the right game for you! 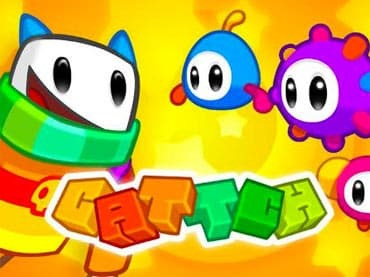 You must take Cattch, a hyper-color cat, on a journey of revenge, to bounce on all those nasty little monsters before the weekend is over, so he can save his friends and finally chill out. Cattch’s extraordinary jumping and landing skills will come in handy while facing insane puzzles in his home world of Cubika. Go CATTCH!!! Cattch is a next generation puzzle platformer, built of square blocks, those crazy cool worlds are full of dangers and surprises—levels will rotate and change shape, throw you in the air and take you underground! If you have questions about Cattch game, please contact us using this form.